We'll spend a full 6 hours with you and your pet, capturing the nuances that are hard to come by in a 1-2 hour session. Includes a 2-3 minute Video + (75) Photos! No time to print? Need more files than your package includes? Additional photographic prints, digital negatives, and specialty canvas prints are always available. Email us for a product catalog! *A travel fee of $1/mile will be added for clients located more than 30 miles outside of Santa Monica. Will travel up to 100 miles. For travel within CA, but outside of 100 miles please email for details. Available for out-of-state sessions via Club Bark. Say goodbye to the archaic photo-business structure of the past - you'll find no "sitting fees" or surprise exorbitant product prices here! We understand that you may want to show off your pup via email, Facebook, and Twitter - or maybe even print a file yourself (gasp!). Our prices are as transparent as they get, and we encourage our clients to shop around in order to assess the real cost of a photo shoot. Some important questions to ask yourself are: will I get digital negatives and is that important to me? Does the package price include any prints? If prints are not included, what sort of printing prices can I expect and how much additional money am I willing to spend? Each of our packages includes 1-2 hours of shooting, digital files suitable for printing up to 8"x10", and 4"x6" prints. 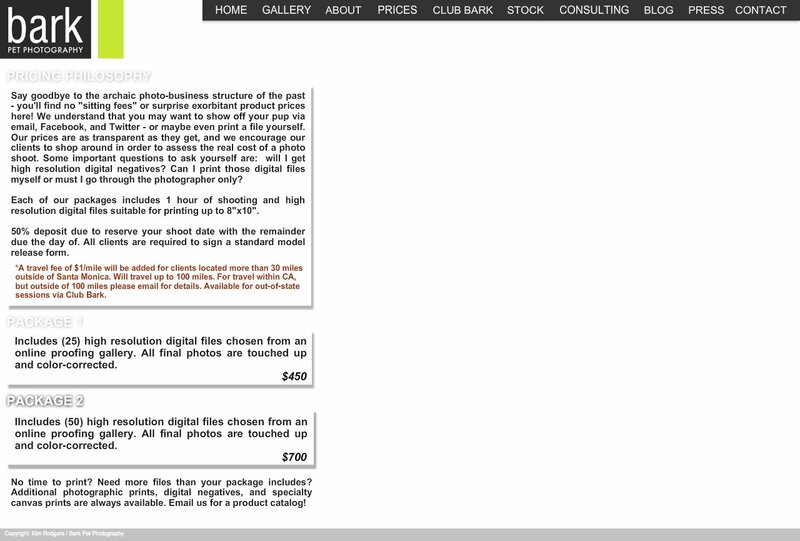 Includes CD of (25) Digital Negatives with 4"x6" Prints and temporary online proofing gallery of 50-100 images. All final photos are touched up and color-corrected. Includes CD of (50) Digital Negatives with 4"x6" Prints and temporary online proofing gallery of 75-150 images. All final photos are touched up and color-corrected.